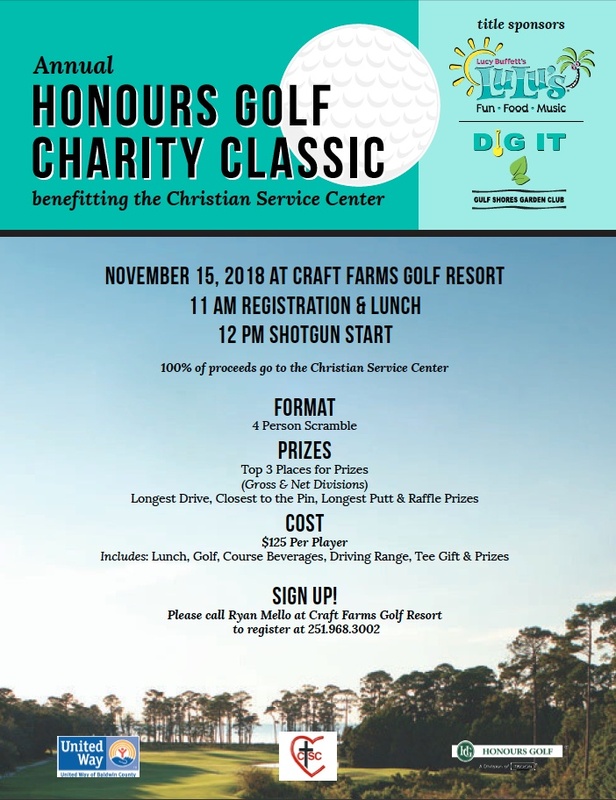 Gulf Shores, Ala. (Wednesday September 5, 2018) – Craft Farms Golf Resort, Peninsula Golf and Racquet Club and Rock Creek Golf Club have joined together to host the Annual Honours Golf Charity Classic sponsored by Lucy Buffett’s LuLu’s. The tournament will be on November 15, 2018, at Craft Farms Golf Resort. The goal of this golf tournament is to raise funds for the Christian Service Center, with 100 percent of tournament proceeds going to the organization. The Gulf Shores Garden Club has also signed on as a major sponsor for this year’s Charity Classic. President Fran Thompson says that the Christian Service Center is a beacon in the community. “This is an important way for us to put funds raised at our annual flower seminar back into the community,” said Thompson. “The CSC is supported by so many in our community, from civic groups, to mardi gras krewes to individuals, because we know that every dollar contributed goes directly to citizens going through hard times. I don’t know if there is another charity anywhere that does as much to maximize the good that it does with the funds that it raises,’’ Thompson added. The Christian Service Center is a 100% volunteer agency funded by the churches of Pleasure Island, various community organizations, including the United Way of Baldwin County, and interested individuals. Clients are given immediate emergency aid as well as guidance on finding solutions to their problems. The CSC also provides a wide range of other services, including assisting with meals on wheels, the summer program for children, and the local food pantry. Currently, committees are at work securing golfers, sponsors and raffle prizes. The tournament can accommodate up to 120 golfers at $125 per player. Tournament fees include lunch, drinks on the course, prizes and a tee gift. The Title Sponsor for this year’s tournament is Lulu’s Gulf Shores. Gulf Shores Garden Club has also signed on as a sponsor. To sign up to play in this event, or for sponsorship opportunities, please contact Ryan Mello, club manager of Craft Farms Golf Resort by calling 251.968.3002.